The concord grapes from my one plant were harvested. Twenty five pounds of quality grapes were obtained. There was no bird damage, no cob webs and no mold or dead grapes.The brix reading was 13. The grapes were removed from the substrate on a mesh screen, cooked and blended into a slurry. The slurry was strained through a food mill, mesh 2mm. Two pounds of grapes were used for each liter of juice This makes a strong rich tasting juice and is of a texture suitable for drinking. 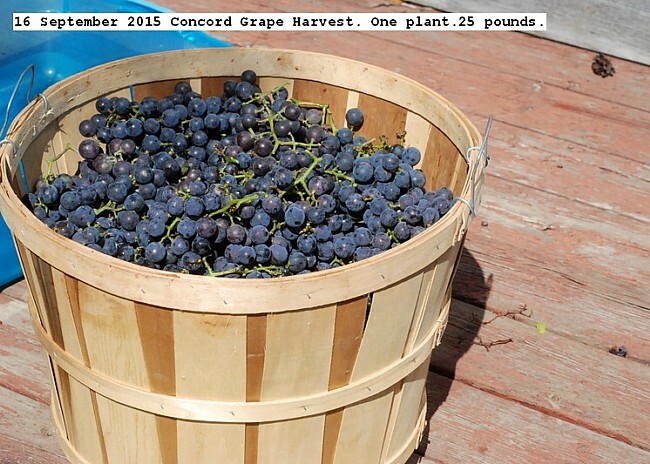 This entry was posted in Uncategorized and tagged 16 September 2015 Concord Grape Harvest, Concord Grape Harvest. Bookmark the permalink.